Here’s a situation that I’m sure you’ve experienced. You’re having an awesome conversation with someone in English. It’s going well, and it seems that you can do that amazing thing — socialise in English. Then you say something that you thought was pretty smart and intelligent and awesome. Why? What did you say?! It’s good to avoid this kind of situation, right? 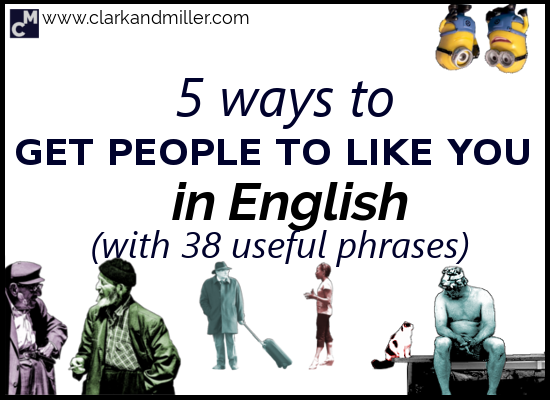 Fortunately, there are strategies that you can use to get people to like you in English. Let’s look at 5 ways to do that. So, this list of phrases will start with… no phrases. It’s amazing how much you can achieve by saying nothing. People love to talk, and that means that they love to be listened to. So just nod and smile! There are two main reasons this is a good idea. First of all, people will like you for it. But also, you’ll be surprised how interesting people are — by letting people just talk, you’ll find out that they met the Queen last week, or that they were the World Junior Rhino Football Champion in 1988. Or that you both like cheese. But if you just nod and smile for too long, people might think that you’re imagining your favourite song. No, back-channelling has nothing to do with TV or swimming. You probably do back-channelling when you’re talking to (or listening to someone) in your own language, as well as English. Back-channelling is using words and sounds to show that you’re interested in what the other person is saying. It’s powerful and awesome. It keeps the conversation going and makes the person you’re speaking to feel confident — which will make them like you. Here are some great back-channels you can use to keep the conversation alive. Be careful — listen closely to the recordings. The meaning can change depending on how you say it. It’s kind of a cliché about English, but it’s true: we really use the polite words and phrases a lot. I’m so sorry — I completely messed up. I’m so sorry — is there anything I can do to make it up to you? If you’re feeling particularly bad about something, you can use more than one of these in the same situation. When we want something from someone, we’ve gotta be polite, right? Would you mind + -ing? Would it be alright if I…? *Only use “mate” with people you’re very comfortable with. Or at least for a while. One of the best ways of making people like you is to show an interest in them. Everyone is different, of course, so asking the right kinds of questions depends on who you’re talking to. If you meet someone at a singles party, and you ask them “how long have you been married?”, then that’s the wrong question. When someone has just had a baby, I have no idea what to ask them. I just feel awkward. Apparently it works every time! Thanks, Nat! It may seem obvious, but you’ll be surprised how rarely people compliment each other. There’s always something awesome about everyone. Once you find it, don’t let it pass — tell that person you think they’re great! Listen, maybe even more than you speak. What’s the nicest compliment someone has ever given you? How did it make you feel? Meanwhile, if you enjoyed this post, don’t forget to BE AWESOME AND SHARE IT! Let’s spread the love of positive, polite conversation that makes everyone feel like a million dollars! Want to work on your English speaking? Click here to get English lessons on Skype. Needless to say it made me feel over the moon. Ooohhh – That’s a good one! I’m not sure anyone can top that. I am fluent in the first two ways. Well, I’m glad the post could both teach you something and also confirm that you’re on the right track at the same time! Good work. Your words made me fly to the moon, you gave me a power to rethink again and overcome obstacles. You just keep on the great job. Definitely, these words taped my heart and grant me more energy. That’s awesome! I love the creativeness of the compliment. Haha! I hope she meant it the right way! Also, the idea of a workshop where everyone gives each other compliments sounds fantastic. It’s like those “laughter workshops.” They look fun! Thanks for all! I think só you made a hard and great job. Keep on it please. Thanks a lot Jose. I really appreciate your encouragement!